Let's start our study of the Turkish language by looking at the Turkish alphabet, vowel harmony, and word order. Turkish uses the Latin alphabet used by western European languages, but with a number of diacritical marks (or "accents" to us non-linguists). For example, Ç and Ş, pronounced as in English church and shoe, respectively. 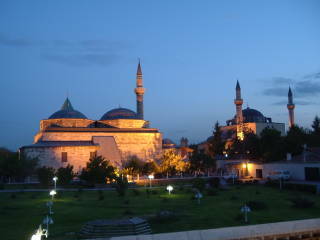 The Mevlana Shrine in Konya. See my travel pages for many more pictures. Turkish uses the Latin alphabet, but with a number of characters with diacritical marks. Turkish uses something called "vowel harmony", in most words the vowels "harmonize", changing so that the vowel sounds and therefore your mouth position and movements are relatively unchanged through the word. It makes the word easier to say if you can figure out how to harmonize the vowels on the fly. Finally, as a non-Indo-European language, Turkish has some grammatical features that seem unusual to speakers of most of the languages based in Europe. English: (The) dog (the) water is drinking. English: (The) Force in this one strong (is). The word immediately before the verb is (usually) the most important word in the sentence and conveys the main point. The subject is often left out if it is a personal pronoun, since it can be derived from the verb conjugation. That's just a very simple statement. See a later page in this series for more details on word order. Note that your choice of browser may limit the accuracy of what is displayed on the screen or printed. Mozilla Firefox and KDE Konqueror display and print these characters fine. Turkish vowels are said to be of two classes, front and back. But there is also the distinction of open versus close(d), and round versus unround. They can be arranged into a cube, as shown here. Turkish has vowel harmony, meaning that a word usually has all its vowels in a single class, front vs back, including those in suffixes added to reflect the part of speech. Elementary Turkish uses the notation V2 to indicate "the variable vowel e/a" which takes one value depending on vowel harmony, and the notation V4 to indicate "the four-variable vowel shown in the following table". More reasonably, Teach Yourself Turkish calls the first "e-type" and the second "i-type". 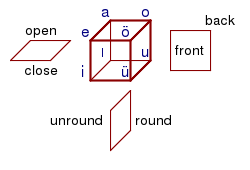 Note the locations of V2/e-type and V4/i-type in the vowel cube. V2/e-type on the upper-left edge, V4/i-type on the bottom face. 1. Back vowels are followed by back vowels, front vowels are followed by front vowels. Do not cross the back/front boundary. 2. Unrounded vowels are followed by unrounded vowels. 3. A rounded vowel may be followed by a mix of rounded closed and unrounded open vowels. A word may not necessarily be internally consistent regarding vowel harmony — it may mix front and back vowels. For example, that word you learn early while riding Turkish buses and wondering what is advertised by so many signs along the highway: sigorta, or insurance. Or kitap, or book. However, much of Turkish grammar is formed by adding suffixes, and these suffixes usually follow vowel harmony with the preceding vowel (there are a few exceptions, suffixes of fixed form not following vowel harmony). Also, a final k "softens" to ğ when a vowel is suffixed — köpek (dog) becomes köpeği when it is the direct object. However, see the next section for some exceptions and irregularities. See the section on morphological changes at the end of the following section on nouns, pronouns, adjectives, etc. for details on other character shifts and some exceptions and irregularities.